Find the z-score of each value in the following data set. Are any of them outliers? Note: A data value is an outlier if its z-score is greater than 3 or less than -3. The negative z-scores mean that the data values 3, 4, 5 and 8 are located below the mean (19). Since 75 has a positive z-score, it means that the value 75 is located above the mean. 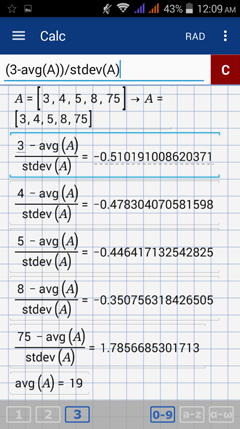 More specifically, the data value 3 is located 0.51 standard deviations below the mean, for example. In addition, the data set has no outliers based on z-scores since no value is farther than 3 standard deviations from the mean. Percentiles and quantiles are also common measures. For example, percentiles are often used for ranking students in terms of scores for any standardized exam. A percentile is a quantile measure that divides the distribution into 100 equal parts, the lowest being the 0th percentile and the highest being the 100th percentile although realistically, a data set can only have 99 percentiles. The kth percentile means that k% of the values lie below the value. For instance, at the 5th percentile, 5% of the data lie below the value while 95% of the data lie above it. A decile is a quantile measure that divides a data set into 10 equal parts, the lowest being the 0th decile and the highest being the 10th decile, but a data set can only have 9 deciles. The kth decile means that k*10% of the data lies below it and (100-10k)% of the data lies above. D6, for example, means that 60% of the data lies below this value, and 40% lies above it. 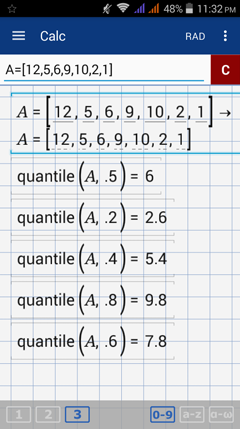 2) Convert the rank (decile, percentile, quartile) into a percent and then to a decimal. Find the following quantiles of the data set below. Enter the data set as a matrix. Convert each rank to percent. Then, to decimal.